Identification: Upperside is black with a few small white spots at the tip of the forewing. Underside is dark brown with violet-gray at the forewing tip and the outer half of the hindwing. Life history: To await receptive females, males perch on the ground or low plants in forest openings or edges, waving their antennae in small circles. Females deposit eggs singly on the host plants; caterpillars eat leaves, and make shelters of rolled and tied leaves. Caterpillars hibernate. Flight: One brood from March-July; a partial second brood up to September in the south. Caterpillar hosts: Various grasses including wild oats (Avena), bent grass (Agrostis), bluegrass (Poa), Bermuda grass (Cynodon dactylon), and Indian woodoats grass (Chasmanthium latifolia). Adult food: These skippers prefer nectar from low-growing blue flowers including verbena and selfheal. Habitat: Open areas in or near woodland, often close to streams. 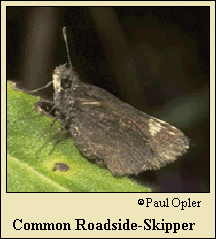 Range: The Roadside Skipper is the most widespread skipper in North America. It occurs from British Columbia east across southern Canada to Maine and Nova Scotia; south to central California, northern New Mexico, Texas, the Gulf states, and northern Florida.